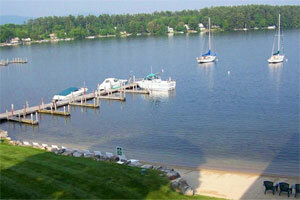 The Center Harbor Inn’s unique access to Lake Winnipesaukee makes us an ideal destination for boaters and water enthusiasts. Right off of our nearly 200 feet of sandy beach, guests who stay with us will have the opportunity to use our large dock and mooring system. This amenity allows vacationers to bring their own boat or rent one and keep it right on the property.